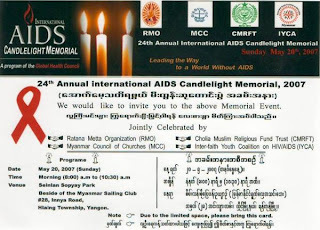 A memorial for people who died from AIDS will be held on May 20, 2007 in Sein Lann So Pyay garden, Hlaing Township, Yangon. I will also go and attend there together with our Searchers-Myanmar group Tomorrow. Myanmar Council of Churches, Ratana Metta Organization, Cholia Muslim Religious Fund Trust, and Inter-faith Youth Coalition on HIV/AIDS.